Ah, Liane Moriarty. The easy summer read you don't need to feel bad about. Liane Moriarty has made a specialty of producing satisfyingly chunky, eminently readable (and 'relatable' -- hate that word!) suburban stories which sneakily also tackle some big issues -- family violence, alcoholism, damaged childhoods. 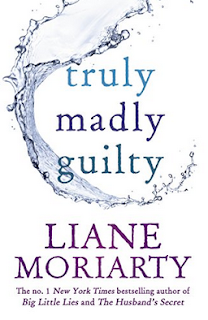 Truly Madly Guilty (which I borrowed from my friend Justine) revolves around events that occur at an ordinary suburban barbecue* -- six adults, three children -- and what goes wrong when people are distracted. Everyone at that barbecue has their own reason to feel guilty about their behaviour that afternoon, and their individual responses to that day weave into an absorbing, sometimes funny, sometimes moving, narrative. It's great to know that an Australian author has had such international success with books that are still solidly Australian. She makes it look easy, but of course it isn't. Her sister Jaclyn is also a writer (in my view, a genius). What a talented family they are -- not ordinary at all. *Barbecue or barbeque? I use the former spelling, this book used the latter. I know it's also correct, but it just looks wrong to me!